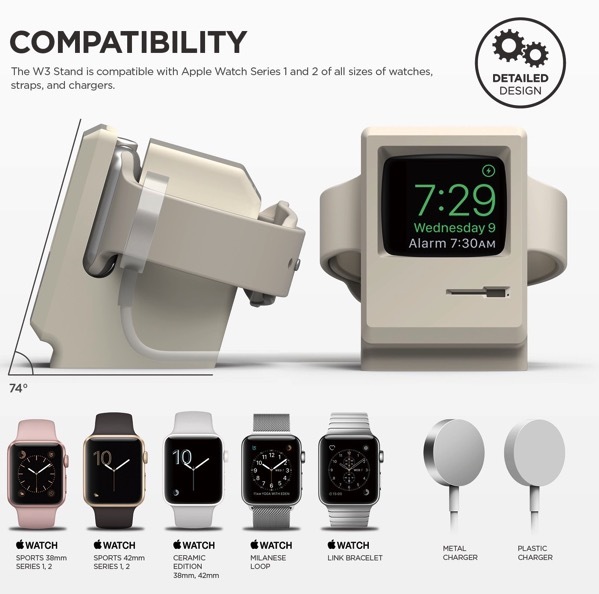 Elago’s W3 charging stand for Apple Watch 1 and 2 lets you view your wearable’s display through a blast from the past, thanks to its vintage design based on the original Macintosh computer. Available for US $13.49 via Elago’s online store, the Nightstand Mode-only stand has a slot for the Apple Watch’s charging puck and a small compartment that you insert your Watch into, supporting both 38mm and 42mm versions. You can also purchase the Elago W3 charging stand on Amazon.ca for $8.67 from a third party seller.